An Internet Service Provider (ISP) is a company that provides you with access to the Internet for a fee. The most common ways to connect to an ISP are by using a wireless link, broadband connection (cable or DSL). In rural area’s where homeowners may not have computers, they get their internet access at Cyber Cafes. When a Cyber Cafe sells a bandwidth connection to their customers, the Cafe is the retailer, and in this case the ISP is the wholesaler; selling the wholesale bandwidth to the Cafe or other large businesses that need an internet connection. To support many clients all of whom demand high quality reliable internet, the difficulty is finding the high Bandwidth. and unless the ISP is located in a major city with good fibre, the ISP has to turn to satellite as the only solution. 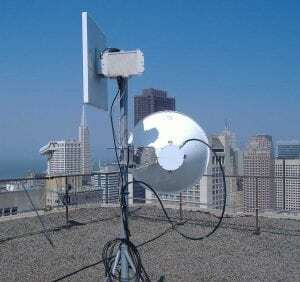 ISP satellite equipment needs in developing countries. In order to transmit and receive from the satellite, a dish, amplifier and modem are all required, but the more bandwidth that is needed, the more that the satellite equipment must be scaled up to handle the data load. This is where the middle to large corporations have to make a choice, do they install the necessary equipment and accept the cost, or do they choose to connect across town to a reliable ISP who has already made the investment. Why does satellite Internet still flourish? 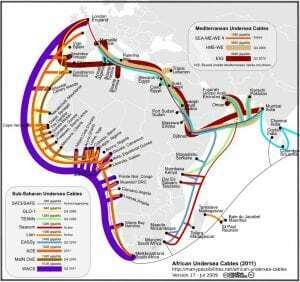 Take Africa as an example, although there are several fiber rings serving the coastal regions, the interior is still poorly linked with fiber service. In other places where fiber is available, poor administration, spotty technical support and outrageous high prices have made it unattractive. For a reasonable cost the ISP owner can install a VSAT system and choose satellite service as the primary or backup service. We discuss satellite service for ISPs in more detail at our sister site:Take a look!